An OLLA is an unglazed clay pot fired at a low temperature. This allows the pot to remain porous. The OLLA is buried in the ground with the neck exposed and periodically filled with water. The water seeps into the soil at a rate that provides adjacent plants with a constant water source at the roots. The use of Ollas is an ancient practice. The first writing about the technique dates back about 2,000 years to China. This system is used in Pakistan, India, Iran, Mexico and Brazil. Irrigation with ollas is said to be up to 10 times more efficient than conventional surface watering. This irrigation technique was introduced to the Americas by Spanish settlers in colonial times. Agriculture and gardening specialists are teaching it, and olla use is making a comeback in New Mexico and the American West. The spacing will depend on plant selection, soil type and temperature. As a general rule, you plant within 18 inches from center or 12 inches from the outer wall. Optimum plant spacing and distance will also be influenced by the root system of the plant. For instance, tomatoes have an aggressive root system, so placing them at the edge of the wetting area will allow ample room for growth. 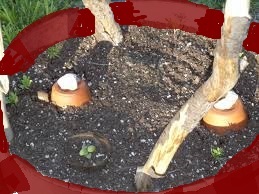 In a 4×4 above ground garden, 4 tomato plants 18 inches from the center of the OLLA work well (see diagram). The smaller the plant, the more one can plant around one OLLA. 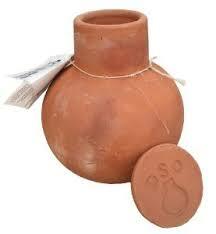 The Sustainable Living Center’s of Ollas is called Pots of Water© They are made of two unglazed clay terracotta pots. 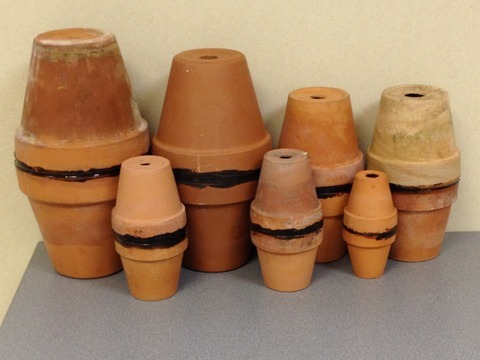 These pots are glued together and an irrigation plug is placed in one end and the other end sealed. The Pots of Water© is buried in the ground and filled with water. 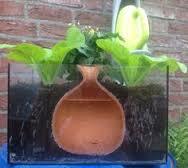 The water seeps into the soil at a rate that provides adjacent plants with a constant water source at the roots. Our Pots of Water© is not only less expensive that the Free Standing Ollas, but is designed to be attached to a continuous water supply system, such as a hose or a rainwater collection system and does not have to be manually filled. Contains no paint or glaze. They are buried in the ground and need to be watered either by hand, garden hose or rain harvesting system. There are small seep holes in the Ollas\Pots of Water due its particular firing method of construction. As it is filled up, it evenly distributes water to the surrounding soil. However the water does not simply empty as it is filled, it only flows out into dry soil. When the soil is sufficiently saturated, water is unable to flow out. The roots of plants will be drawn to the Pots of Water. The water is directly injected into the ground near the roots and is not subject to evaporation or run-off. Keeping water away from the surface layer of soil prevents weed growth. You can surround the Ollas\Pots of Water with mulch to further suppress weeds. Either the Pots of Water or Olla can be utilized for vegetable, landscape, and container gardening. They are especially useful in arid climates but can be used any time a steady and efficient water source is needed. . This entry was posted on September 24, 2015 by Kayak Rentals & Sustainable Living.